The Travlrr platform is a private workspace that allows you to match your brief requirements with a curated marketplace of premium production companies, photographers & self-shooters. 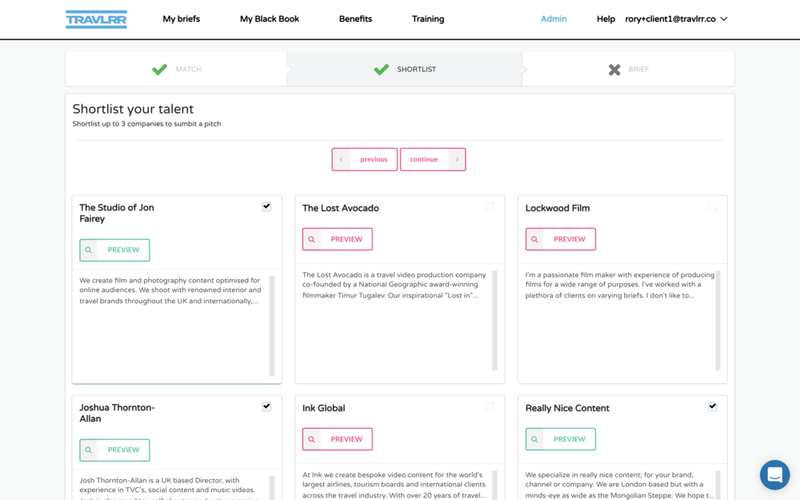 You can then use our centralised dashboard to fully workflow your brief, review treatments & budgets, commission, contract & pay, message, feedback and approve final content. We’ve curated some of the world’s finest production companies, photographers, self shooter and specialist (Drone, underwater & creative editors) All have a proven track record in the Travel & Lifestyle sector and each is keen to pitch on your specific brief. Complete the briefing form and the platform will match you with the most relevant, curated and best in class production companies, photographers, self-shooters & specialists anywhere in the world to then engage with your bespoke brief. Invite your internal content, strategists and producer team to collaborate on the briefing. Review the matched production companies, photographers, self-shooters or specialists profiles. Profiles include a showreel, full examples of previous work, listing of previous clients and services that they offer. Production partners are rated by previous clients to help you make the right decision for your bespoke brief. 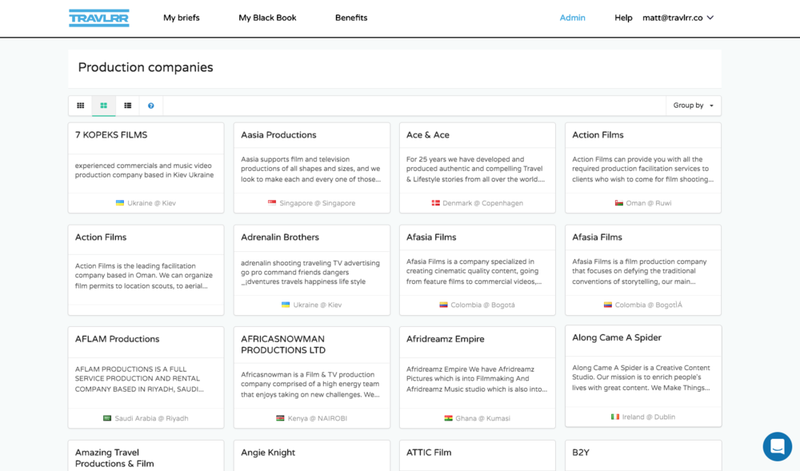 Once you have shortlisted up to 3 production partners to fully brief you will be able to discuss your unique brief and thereafter receive treatments & budgets for review before you agree and commission. Your production process can be managed using video calls, meetings and our intuitive workflow communication tools to help keep your production on track. Discuss and agree the final deliverables with your commissioned production company, photographer, self-shooter or specialist and review uploaded documents for contracts, timings, insurance and make initial payments to secure your production partner. 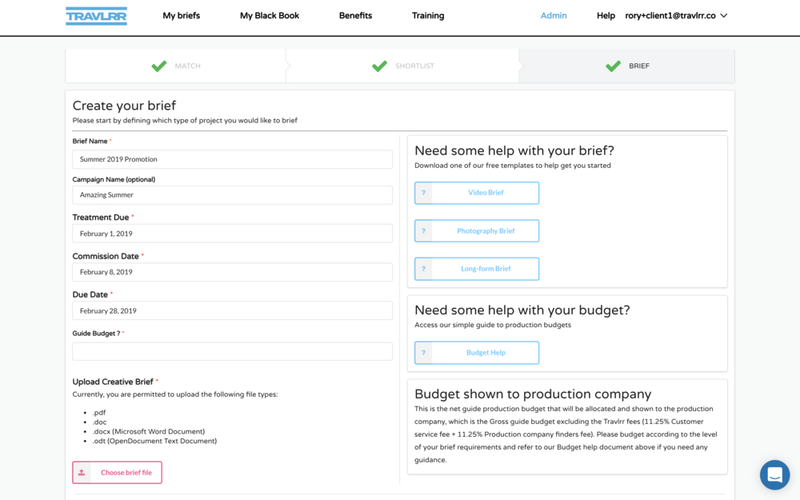 Invite other members of your business to collaborate on the brief. Once you are in production you can manage the brief to workflow and communicate with your production company, photographer or self-shooter, review and comment on edits, approve final creative, receive final files and review payments status. Build up your own private black book from production companies, photographers or self-shooters you have used before. Privately brief them directly via the platform if you would like to work with them again saving further time, cost and resource.